Boris Nikolayevich Yeltsin (February 1, 1931 – April 23, 2007) was the first president of the Russian Federation, serving from 1991 to 1999. Yeltsin came to power on a wave of high expectations. On June 12, 1991 he was elected president of the Russian Soviet Federated Socialist Republic with 57 percent of the vote, becoming the first popularly elected president in Russian history. He led the opposition to an attempted coup by communist hardliners opposed to the strategic reforms of Mikail Gorbachev. In December 1991 he withdrew the Russian Federation from the Soviet Union, resulting in the Soviet Union's immediate demise. As President, Yeltsin introduced a series of reforms to try to move Russia from a socialist command economy to a to a free market liberal democracy. The Yeltsin era was a traumatic period in Russian history; a period marked by massive, growing corruption, the loss of a sense of national identity, economic upheaval, and enormous political and social problems. A few people took advantage of the confusion of the Yeltsin era to amass enormous fortunes. Organized crime flourished at the same time that the remnants of the educational, health and welfare structures of the Soviet system unraveled. 5.1.4 Privatization and the rise of "the oligarchs"
Yeltsin was blamed for many of the problems of this period. By the time he left office, Yeltsin was a deeply unpopular figure in Russia, with an approval rating as low as two percent by some estimates. Yeltsin was not able to accomplish many of his social and economic objectives, but paramount on his list of political objectives was ensuring that a return to communism was not possible. Boris Yeltsin's legacy will be forever linked to the bold actions that he took in late December 1991 supporting the dissolution of the Soviet Union and resulting in its immediate break-up. Following the dissolution of the Soviet Union in December 1991, Yeltsin, vowing to transform Russia's Communist planned economy into a capitalist market economy, endorsed a program of "shock therapy," cutting Soviet-era price controls and introducing drastic cuts in state spending. However, the reforms came too quickly in some respects and too slowly in others, and through corruption in the state departments a handful of people were able to enrich themselves while stamping out competitors. The reforms also devastated the living standards of much of the population, especially the groups dependent on Soviet-era state subsidies and welfare entitlement programs. Through the 1990s, Russia's GDP fell by 50 percent, vast sectors of the economy were wiped out. Inequality and unemployment grew dramatically, while incomes fell. Hyperinflation, caused by the Central Bank of Russia's loose monetary policy, wiped out a lot of personal savings, and tens of millions of Russians were plunged into poverty. In August 1991, Yeltsin won international plaudits for casting himself as a democrat and defying the August coup attempt of 1991 by hard-line Communists. But he left office widely despised as a desperate, ailing autocrat among the Russian population. As president, Yeltsin's conception of the presidency was highly autocratic. Yeltsin either acted as his own prime minister (until June 1992) or appointed men of his choice, regardless of parliament. His confrontations with parliament climaxed in the October 1993 Russian constitutional crisis, when Yeltsin called up tanks to shell the Russian White House, blasting out his opponents in parliament. Later in 1993, Yeltsin imposed a new constitution with strong presidential powers, which was approved by referendum in December. Following the 1998 Russian financial crisis, Yeltsin was at the end of his political career. Just hours before the first day of 2000, Yeltsin made a surprise announcement of his resignation, leaving the presidency in the hands of Vladimir Putin. Boris Yeltsin was born in the village of Butka, in Talitsky District of Sverdlovsk Oblast, Russia. His father, Nikolay Yeltsin, was convicted of anti-Soviet agitation in 1934 and sentenced to hard labor in a gulag for three years. Following his release he remained unemployed for a period of time and then worked in construction. His mother, Klavdiya Vasilyevna Yeltsina, worked as a seamstress. Boris Yeltsin studied at Pushkin High School in Berezniki in Perm Krai. He was fond of sports (in particular skiing, gymnastics, volleyball, track and field, boxing and wrestling) despite losing the thumb and index finger of his left hand when he and some friends snuck into a Red Army supply depot, stole several grenades, and tried to dissect them. Yeltsin received his higher education at the Ural Polytechnic Institute in Sverdlovsk, majoring in construction; he graduated in 1955. The subject of his degree paper was "Television Tower." From 1955 to 1957 he worked as a foreman with the building trust Uraltyazhtrubstroi and from 1957 to 1963 he worked in Sverdlovsk, and was promoted from construction site superintendent to chief of the Construction Directorate with the Yuzhgorstroi Trust. In 1963 he became chief engineer, and in 1965 head of the Sverdlovsk House-Building Combine. He joined the ranks of the CPSU nomenklatura in 1968 when he was appointed head of construction with the Sverdlovsk Regional Party Committee. In 1975 he became secretary of the regional committee in charge of the region's industrial development. In 1976 the Politburo of the CPSU promoted him to the post of the first secretary of the CPSU Committee of Sverdlovsk Oblast (effectively he became the head of one of the most important industrial regions in the USSR), he remained in this position till 1985. "I sincerely believed in the ideals of justice propagated by the party, and just as sincerely joined the party, made a thorough study of the charter, the program and the classics, re-reading the works of Lenin, Marx and Engels." In 1977 as party boss in Sverdlovsk, Yeltsin—on orders from Moscow—ordered the destruction of the Ipatiev House where the last Russian tsar had been killed by Bolshevik troops. The Ipatiev House was demolished in one night, July 27, 1977. Also during Yeltsin's stay in Sverdlovsk, a CPSU palace was built which was named "White Tooth" by the residents. During this time, Yeltsin developed connections with key people in the Soviet power structure. He was appointed to the Politburo, and was also "Mayor" of Moscow (First Secretary of the CPSU Moscow City Committee) from December 24, 1985 to 1987. He was promoted to these high rank positions by Mikhail Gorbachev and Yegor Ligachev, who presumed that Yeltsin would be their man. Yeltsin was also given a country house (dacha) previously occupied by Gorbachev. During this period Yeltsin portrayed himself as a reformer and populist (for example, he took a trolleybus to work), firing and reshuffling his staff several times. His initiatives became popular among Moscow residents. In 1987, after a confrontation with hardliner Yegor Ligachev and Mikhail Gorbachev about Gorbachev's wife, Raisa, meddling in affairs of the state, Yeltsin was sacked from his high ranking party positions. On October 21, 1987 at the plenary meeting of the Central Committee of the CPSU, Yeltsin, without prior approval from Gorbachev, lashed out at the Politburo. He expressed his discontent with both the slow pace of reform in society and the servility shown to the General Secretary, then asked to resign from the Politburo, adding that the City Committee would decide whether he should resign from the post of first secretary of the Moscow City Party Committee. In his reply, Gorbachev accused Yeltsin of "political immaturity" and "absolute irresponsibility," and at the plenary meeting of the Moscow City Party Committee proposed relieving Yeltsin of his post of first secretary. Nobody backed Yeltsin. Criticism of Yeltsin continued on November 11, 1987 at the meeting of the Moscow City Party Committee. After Yeltsin admitted that his speech had been a mistake, he was fired from the post of first secretary of the Moscow City Committee. He was demoted to the position of first deputy commissioner for the State Committee for Construction. After his firing, Yeltsin was hospitalized and later (confirmed by Nikolai Ryzhkov) attempted suicide. He was perturbed and humiliated but began plotting his revenge. His opportunity came with Gorbachev's establishment of the Congress of People's Deputies. He recovered, and started intensively criticizing Gorbachev, highlighting the slow pace of reform in the Soviet Union as his major argument. Yeltsin's criticism of the Politburo and Gorbachev led to a smear campaign against him, in which examples of Yeltsin's awkward behavior were used against him. An article published in Pravda described him as a drunk at a lecture during his visit to the United States, an allegation which appeared to be confirmed by a TV account of his speech. However, popular dissatisfaction with the regime was very strong, and these attempts to smear Yeltsin only added to his popularity. In another incident, Yeltsin fell from a bridge. Commenting on this event, Yeltsin hinted that he was helped to fall from the bridge by the enemies of perestroika, but his opponents suggested that he was simply drunk. In March 1989, Yeltsin was elected to the Congress of People's Deputies as the delegate from Moscow district, gaining a seat on the Supreme Soviet. In May 1990, he was elected chairman of the Presidium of the Supreme Soviet of the Russian SFSR (RSFSR). He was supported by both democratic and conservative members of the Supreme Soviet, which sought power in the developing political situation in the country. A part of this power struggle was the opposition between power structures of the Soviet Union and the RSFSR. In an attempt to gain more power, on 12 June 1990, the Congress of People's Deputies of the RSFSR adopted a declaration of sovereignty and Yeltsin quit the CPSU in July 1990. On June 12, 1991, Yeltsin won 57 percent of the popular vote in the democratic presidential elections for the Russian republic, defeating Gorbachev's preferred candidate, Nikolai Ryzhkov. In his election campaign, Yeltsin criticized the "dictatorship of the center," but did not suggest the introduction of a market economy. Instead, he said that he would put his head on the railtrack in the event of increased prices. 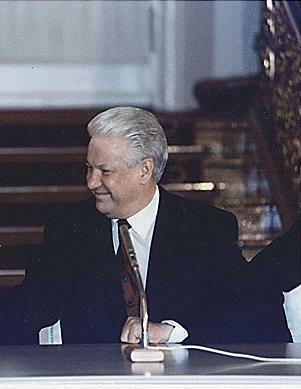 Yeltsin took office on July 10. On August 18, 1991, a coup against Gorbachev was launched by hardline communists headed by Vladimir Kryuchkov. Gorbachev was held in Crimea while Yeltsin raced to the White House of Russia (residence of the Supreme Soviet of the RSFSR) in Moscow to defy the coup. The White House was surrounded by the military but the troops defected in the face of mass popular demonstrations. Yeltsin responded to the coup by making a memorable speech from the turret of a tank. By August 21 most of the coup leaders had fled Moscow and Gorbachev was "rescued" from Crimea and then returned to Moscow. Yeltsin was subsequently hailed by his supporters around the world for rallying mass opposition to the coup. Although restored to his position, Gorbachev's powers were now fatally compromised. Neither union nor Russian power structures heeded his commands as support had swung over to Yeltsin. Through the fall of 1991, the Russian government took over the union government, ministry by ministry. In November 1991, Yeltsin issued a decree banning the Communist Party throughout the RSFSR. In early December 1991, Ukraine voted for independence from the Soviet Union. A week later, on December 8, Yeltsin met with Ukrainian president Leonid Kravchuk and the leader of Belarus, Stanislav Shushkevich, in Belovezhskaya Pushcha, where the three presidents announced the dissolution of the Soviet Union and that they would establish a voluntary Commonwealth of Independent States (CIS) in its place. According to Mikhail Gorbachev, the president of the Soviet Union at that time, Yeltsin kept the plans of the Belovezhskaya meeting in strict secrecy and the main goal of the dissolution of the Soviet Union was to get rid of Gorbachev, who by that time had started to recover his position after the events of August. Mikhail Gorbachev has also accused Yeltsin of violating the people's will expressed in the referendum in which the majority voted to keep the Soviet Union. On December 24, the Russian Federation took the Soviet Union's seat in the United Nations. The next day, President Gorbachev resigned and the Soviet Union ceased to exist (see Collapse of the Soviet Union), thereby ending the world's largest and most influential communist regime. Economic relations between the former Soviet republics were severely compromised. Millions of native Russians found themselves in the newly formed "foreign" countries. Just days after the dissolution of the Soviet Union, Boris Yeltsin resolved to embark on a program of radical economic reform, with the aim of restructuring Russia's economic system—converting the world's largest socialist planned economy into a market-oriented capitalist one. During early discussions of this transition, Yeltsin's advisers debated issues of speed and sequencing, with an apparent division between those favoring a rapid approach and those favoring a gradual or slower approach. In late 1991 Yeltsin turned to the advice of Western economists, and Western institutions such as the IMF, the World Bank, and the U.S. Treasury Department, who had developed a standard policy recipe for transition economies in the late 1980s. This policy recipe came to be known as the "Washington Consensus" or "shock therapy," a combination of measures intended to liberalize prices and stabilize the state's budget. Such measures had been attempted in Poland, and advocates of "shock therapy" felt the same could be done in Russia. Some Russian policymakers were skeptical that this was the way to go, but the approach was favored by Yeltsin's deputy, Yegor Gaidar, a 35-year-old Russian economist inclined toward radical reform. In January 1992, Gaidar convinced Yeltsin to introduce a program of "shock therapy" in Russia. On January 2, Yeltsin, acting as his own prime minister, ordered the liberalization of foreign trade, prices, and currency. At the same time, Yeltsin followed a policy of 'macroeconomic stabilization,' a harsh austerity regime designed to control inflation. Under Yeltsin's stabilization program, interest rates were raised to extremely high levels to tighten money and restrict credit. To bring state spending and revenues into balance, Yeltsin raised new taxes heavily, cut back sharply on government subsidies to industry and construction, and made steep cuts to state welfare spending. In early 1992, prices skyrocketed throughout Russia, and a deep credit crunch shut down many industries and brought about a protracted depression. Many state enterprises shut down as they found themselves without orders or financing. The living standards of much of the population were devastated. In the 1990s Russia suffered an economic downturn more severe than the United States or Germany had undergone six decades earlier in the Great Depression. Russian commentators and even some Western economists, such as Marshall Goldman, widely blamed Yeltsin's Western-backed economic program for the country's disastrous economic performance in the 1990s. Politicians quickly began to distance themselves from the program. In February 1992, Russia's vice president, Alexander Rutskoy denounced the Yeltsin program as "economic genocide." By 1993 conflict over the reform direction escalated between Yeltsin on the one side, and the opposition to radical economic reform in Russia's parliament on the other. Also throughout 1992, Yeltsin wrestled with the Supreme Soviet and the Congress of People's Deputies for control over government, government policy, government banking and property. In the course of 1992, the speaker of the Russian Supreme Soviet, Ruslan Khasbulatov, came out in opposition to the reforms, despite claiming to support Yeltsin's overall goals. In December 1992, the 7th Congress of People's Deputies succeeded in turning down the Yeltsin-backed candidacy of Yegor Gaidar for the position of Russian prime minister. The conflict escalated on March 20, 1993 when Yeltsin, in a televised address to the nation, announced that he was going to assume certain "special powers" in order to implement his program of reforms. In response, the hastily-called 9th Congress of People's Deputies attempted to remove Yeltsin from presidency through impeachment, March 26, 1993. Yeltsin's opponents gathered more than 600 votes for impeachment, but fell 72 votes short of the required two-thirds majority. On September 21, 1993 Yeltsin announced in a televised address his decision to disband the Supreme Soviet and Congress of People's Deputies by decree. In his address Yeltsin declared his intent to rule by decree until the election of the new parliament and a referendum on a new constitution, triggering the constitutional crisis of October 1993. On the night after Yeltsin's televised address, the Supreme Soviet declared Yeltsin removed from presidency, by virtue of his breaching the constitution, and Vice-President Alexander Rutskoy was sworn in as the acting president. Between September 21–24, Yeltsin was confronted by significant popular unrest, encouraging the defenders of the parliament. Moscow saw what amounted to a spontaneous mass uprising of anti-Yeltsin demonstrators numbering in the tens of thousands marching in the streets resolutely seeking to aid forces defending the parliament building. The demonstrators were protesting the new and terrible living conditions under Yeltsin. Since 1989 GDP had declined by half. Corruption was rampant, violent crime was skyrocketing, medical services were collapsing, food and fuel were increasingly scarce and life expectancy was falling for all but a tiny handful of the population; moreover, Yeltsin was increasingly getting the blame. By early October, Yeltsin had secured the support of Russia's army and ministry of interior forces. In a massive show of force, Yeltsin called up tanks to shell the Russian White House, Russia's parliament building, blasting out his opponents. Candidates identified with Yeltsin's economic policies were overwhelmed by a huge anti-Yeltsin vote, the bulk of which was divided between the Communist Party and ultra-nationalists. The referendum, however, held at the same time, approved the new constitution, which significantly expanded the powers of the president, giving Yeltsin a right to appoint the members of the government, to dismiss the prime minister and, in some cases, to dissolve the Duma. In December 1994, Yeltsin ordered the military invasion of Chechnya in an attempt to restore Moscow's control over the separatist republic. Yeltsin later withdrew federal forces from Chechnya under a 1996 peace agreement brokered by Alexander Lebed, then Yeltsin's security chief. The deal allowed Chechnya greater autonomy but not full independence. Following the collapse of the Soviet Union, Yeltsin promoted privatization as a way of spreading ownership of shares in former state enterprises as widely as possible to create political support for his economic reforms. In the West, privatization was viewed as the key to the transition from communism in Eastern Europe, ensuring a quick dismantling of the Soviet-era planned economy to make way for "free market reforms." In the early 1990s, Anatoly Chubais, Yeltsin's deputy for economic policy, emerged as a leading advocate of privatization in Russia. In late 1992, Yeltsin launched a program of free vouchers as a way to give mass privatization a jump-start. Under the program, all Russian citizens were issued vouchers, each with a nominal value of around 10,000 rubles, for purchase of shares of select state enterprises. Although each citizen initially received a voucher of equal face value, within months most of them converged in the hands of intermediaries who were ready to buy them for cash right away. In 1995, as Yeltsin struggled to finance Russia's growing foreign debt and gain support from the Russian business elite for his bid in the spring 1996 presidential elections, the Russian president prepared for a new wave of privatization offering stock shares in some of Russia's most valuable state enterprises in exchange for bank loans. The program was promoted as a way of simultaneously speeding up privatization and ensuring the government a much-needed infusion of cash for its operating needs. However, the deals were effectively giveaways of valuable state assets to a small group of tycoons in finance, industry, energy, telecommunications, and the media who came to be known as the "Russian oligarchs" in the mid-1990s. By summer 1996, substantial ownership shares over major firms were acquired at very low prices by the "oligarchs." Boris Berezovsky, who controlled major stakes in several banks and the national media, emerged as one of Yeltsin's most prominent backers. Along with Berezovsky, Mikhail Khodorkovsky, Roman Abramovich, Vladimir Potanin, Vladimir Bogdanov, Rem Viakhirev, Vagit Alekperov, Viktor Chernomyrdin, Victor Vekselberg, and Mikhail Fridman emerged as Russia's most powerful and prominent oligarchs. Panic struck the Yeltsin team when opinion polls suggested that the ailing president could not win; some members of his entourage urged him to cancel presidential elections and effectively rule as dictator from then on. Instead, Yeltsin changed his campaign team, assigning a key role to his daughter, Tatyana Dyachenko, and appointing Chubais as campaign manager. Chubais, acting as both Yeltsin's campaign manager and adviser on Russia's privatization program, used his control of the privatization program as an instrument of Yeltsin's reelection campaign. In the spring of 1996, Chubais and Yeltsin recruited a handful of financial and media oligarchs to bankroll the Yeltsin campaign and guarantee favorable media coverage for the president on national television and in leading newspapers. In return, Chubais allowed well-connected Russian business leaders to acquire majority stakes in some of Russia's most valuable state-owned assets. The media painted a picture of a fateful choice for Russia, between Yeltsin and a "return to totalitarianism." The oligarchs even played up the threat of civil war if a Communist were elected president. In his second term, Yeltsin was unable to follow through on most of his campaign promises, except for ending the Chechen war, which was halted for most of the period. In July 1996, Yeltsin was re-elected as president with financial support from influential business oligarchs who owed their wealth to their connections with Yeltsin's administration. Despite only gaining 35 percent of the first round vote in the 1996 elections, Yeltsin defeated his communist rival Gennady Zyuganov with almost 54 percent in the runoff election. Later that year, Yeltsin underwent heart bypass surgery and remained in the hospital for months. During Yeltsin's presidency, Russia received US$ 40 billion in funds from the IMF and other international lending organizations. However, his opponents allege that most of these funds were stolen by people from Yeltsin's circle and placed in foreign banks. In 1998, a political and economic crisis emerged when Yeltsin's government defaulted on its debts, causing financial markets to panic and the ruble to collapse in the 1998 financial crisis. During the 1999 Kosovo war, Yeltsin strongly opposed the NATO military campaign against Yugoslavia, and warned of possible Russian intervention if NATO deployed ground troops to Kosovo. In televised comments he stated: "I told NATO, the Americans, the Germans: Don't push us toward military action. Otherwise there will be a European war for sure and possibly world war." On May 15, 1999, Yeltsin survived another impeachment attempt, this time by the democratic and communist opposition in the State Duma. He was charged with several unconstitutional activities, including the signing of the Belavezha Accords, dissolving the Soviet Union in December 1991, the coup d'état in October 1993, and initiating the war in Chechnya in 1994. None of these charges received the two-thirds majority of the Duma which was required to initiate the process to impeach the president. On August 9, 1999, Yeltsin fired his prime minister, Sergei Stepashin, and for the fourth time, fired his entire cabinet. In Stepashin's place he appointed Vladimir Putin, relatively unknown at that time, and announced his wish to see Putin as his successor. In late 1999 Yeltsin and President Clinton openly disagreed on the war in Chechnya. At the November meeting of the Organization for Security and Cooperation in Europe, Clinton pointed his finger at Yeltsin and demanded he halt bombing attacks that had resulted in many civilian casualties. Yeltsin immediately left the conference. In December while visiting China to seek support on Chechnya, Yeltsin replied to Clinton’s criticism of a Russian ultimatum to citizens of Grozney. He bluntly pronounced: "Yesterday, Clinton permitted himself to put pressure on Russia. It seems he has for a minute, for a second, for half a minute, forgotten that Russia has a full arsenal of nuclear weapons. He has forgotten about that." Clinton dismissed Yeltsin's comments stating: "I didn't think he'd forgotten that America was a great power when he disagreed with what I did in Kosovo." It fell to Vladimir Putin to downplay Yeltsin's comments and present reassurances about U.S. and Russian relations. "I want to beg forgiveness for your dreams that never came true. And also I would like to beg forgiveness not to have justified your hopes." According to numerous reports, Yeltsin struggled with alcoholism. The subject made headlines abroad during Yeltsin's visit to the U.S. in 1989 for a series of lectures on social and political life in the Soviet Union. That trip was described by a scandalous publication in the Italian newspaper La Repubblica. The article reported that Yeltsin often appeared drunk in public. The article was reprinted by Pravda. Yeltsin's alleged alcoholism was also the subject of media discussion following his meeting with U.S. Deputy Secretary of State Strobe Talbott following Clinton's inauguration in 1993 and after his flight stop-over at Shannon Airport, Ireland in September 1994 when the waiting Irish premier Albert Reynolds was told that Yeltsin was unwell and would not be leaving the aircraft. After Yeltsin's death, a Dutch neurosurgeon revealed that his team was secretly flown to Moscow to operate on Yeltsin in 1999. Yeltsin suffered from an unspecified neurological disorder that affected his sense of balance, causing him to wobble as if in a drunken state; the goal of the operation was reduce the pain. Yeltsin's personal and health problems received a great deal of attention in the global press. As the years went on, he was often viewed as an increasingly unstable leader, rather than the inspiring figure who stood up to the Communist era leaders. The possibility that he might die in office was often discussed. Yeltsin maintained a low profile after his resignation, making almost no public statements or appearances. However, on 13 September 2004, following the Beslan school hostage crisis and nearly-concurrent terrorist attacks in Moscow, Putin launched an initiative to replace the election of regional governors with a system whereby they would be directly appointed by the president and approved by regional legislatures. Yeltsin, together with Mikhail Gorbachev, publicly criticized Putin's plan as a step away from democracy in Russia and a return to the centrally-run political apparatus of the Soviet era. In September 2005, Yeltsin underwent a hip operation in Moscow after breaking his femur in a fall while vacationing on the Italian island of Sardinia. On February 1 2006, Yeltsin celebrated his 75th birthday. He used this occasion as an opportunity to criticize a "monopolistic" U.S. foreign policy, and to state that Vladimir Putin was the right choice for Russia. He also disputed accusations of corruption and the term "Family." Boris Yeltsin died of congestive heart failure on April 23, 2007 at the age of 76. . According to experts quoted by Komsomolskaya Pravda, the recent outbreak of Yeltsin's disease was due to his visit to Jordan from March 25 to April 2. He was buried in the Novodevichy Cemetery on April 25, 2007 , following a period during which his body had lain in state in the Cathedral of Christ the Savior, Moscow. Yeltsin is the first Russian statesman in 113 years to be buried in a church ceremony, since the death of Emperor Alexander III . The day of his funeral was declared by President Putin to be a national day of mourning with flags flown at half-staff and all entertainment programs suspended for the day. Yeltsin was survived by his wife, Naina Iosifovna Yeltsina, whom he married in 1956, and their two daughters Yelena and Tatyana, born in 1957 and 1959, respectively. Yeltsin's "presidency has inscribed him forever in Russian and in world history." … "A new democratic Russia was born during his time: a free, open and peaceful country. A state in which the power truly does belong to the people." … "the first President of Russia’s strength consisted in the mass support of Russian citizens for his ideas and aspirations. Thanks to the will and direct initiative of President Boris Yeltsin a new constitution, one which declared human rights a supreme value, was adopted. It gave people the opportunity to freely express their thoughts, to freely choose power in Russia, to realize their creative and entrepreneurial plans. This Constitution permitted us to begin building a truly effective Federation." 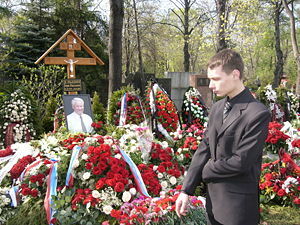 … "We knew (Yeltsin) as a brave and a warm-hearted, spiritual person. He was an upstanding and courageous national leader. And he was always very honest and frank while defending his position." … "[Yeltsin] assumed full responsibility for everything he called for, for everything he aspired to. For everything he tried to do and did do for the sake of Russia, for the sake of millions of Russians. And he invariably took upon himself, let it in his heart, all the trials and tribulations of Russia, peoples’ difficulties and problems. "- Vladimir Putin`s Address on the Occasion of Boris Yelstin’s Passing. Kremlin, April 23, 2007. "I offer my deepest condolences to the family of a man on whose shoulders rested many great deeds for the good of the country and serious mistakes—a tragic fate". ↑ JONATHAN MANN, "50 candles in Chisinau Kishinev. Russia's Vladimir Putin marks his birthday quietly on a trip to Moldova." CNN Transcripts, October 7, 2002. CNN Retrieved October 18, 2008. ↑ Peter Nolan. China's Rise, Russia's Fall. (Macmillan Press, 1995), 17–18. ↑ Celestine Bohlen, "Yeltsin Deputy Calls Reforms 'Economic Genocide,'" New York Times, February 9, 1992. ↑ Constitution of the Russian Federation, Sec. One: Chapter 4. President of the Russian Federation Bucknell University, Russian studies. Retrieved October 18, 2008. ↑ CNN, Russian presidential candidate profiles, 1906. ↑ Pekka Sutela, "Insider Privatization in Russia: Speculations on Systemic Changes," Europe-Asia Studies 46(3) (1994): 420-421. ↑ CNN Interactive: Pivotal Elections: Russian Elections ; Candidates : Boris Yeltsin  CNN Retrieved October 18, 2008. ↑ Lee Hockstader, Washington Post Foreign Service, Friday, July 5, 1996, Victory in Hand, Yeltsin Retains PremierWashington Post Retrieved October 18, 2008. ↑ Michael Laris, "In China, Yeltsin Lashes Out at Clinton Criticisms of Chechen War Are Met With Blunt Reminder of Russian Nuclear Power." Washington Post December 10, 1999, A35. ↑ Mikhail Gorbachev and Boris Yeltsin Speak out Against Putin’s Reforms. MosNews.com (2004-09-16). Retrieved 2007-04-17. ↑ In quotes: Reactions to Yeltsin death BBC News, April 23, 2007. Aslund, Anders, "Russia's Collapse," Foreign Affairs (September/October 1999),  foreignaffairs. Retrieved October 18, 2008. Babington, Charles, "Clinton Spars With Yeltsin On Chechnya, President Denounces Killing of Civilians," Washington Post, November 19, 1999, A01. Bohlen, Celestine, "Yeltsin Deputy Calls Reforms 'Economic Genocide,'" New York Times, February 9, 1992. Gerber, Theodore P., Michael Hout, "More Shock than Therapy: Market Transition, Employment, and Income in Russia, 1991–1995," AJS 104 (1) (July 1998): 1–50. 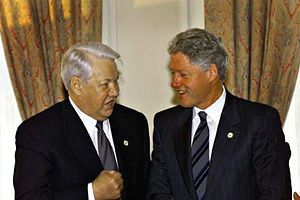 Laris, Michael, "In China, Yeltsin Lashes Out at Clinton Criticisms of Chechen War Are Met With Blunt Reminder of Russian Nuclear Power," Washington Post, December 10, 1999, A35. Nolan, Peter. China's Rise, Russia's Fall. Macmillan Press, 1995. All links retrieved December 19, 2016. Michael Hammerschlag, Death of a Bear- Hammernews.com. This page was last modified on 19 December 2016, at 16:37.